Located along Millennium Avenue at the National Arboretum is the above life-size statue. 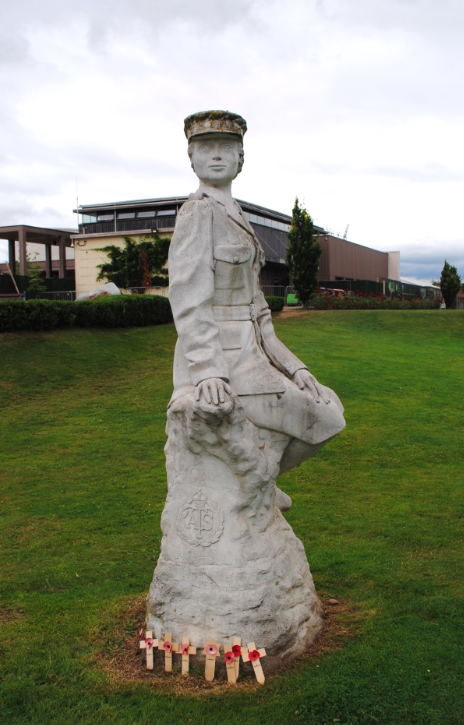 Dedicated to the members who played an important role in World War II, the statue depicts an Auxiliary Territorial Service (ATS) girl wearing the basic khaki uniform. The ATS was formed in September 1938 and was made up of volunteers who underwent six weeks of basic training. The ATS was disbanded in 1949 and the Women’s Royal Army Corps was formed. 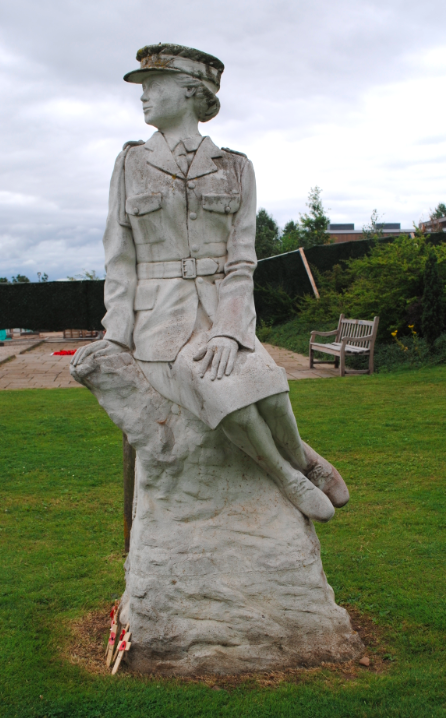 The memorial statue is the work of sculptor Andy De Comyn who used his wife Francesca as the model. Consisting of a cementitous render over a reinforced concrete core, the appearance of the statue is akin to limestone and designed to withstand weathering and acid rain. 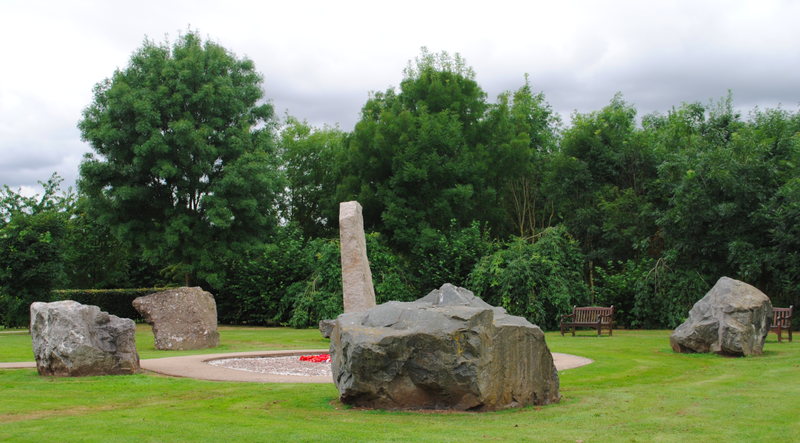 Located along Millennium Avenue at the National Arboretum is the above memorial dedicated to the memory of those who fell by the wayside on the many routes from Polish POW camps. Marching in appalling conditions on those journeys, many veterans suffered diseases such as typhoid and diphtheria or carried wounds inflicted prior to or after capture. During one of Germany’s worst recorded winters, all POW’s were malnourished and had inadequate clothing or equipment to protect them. 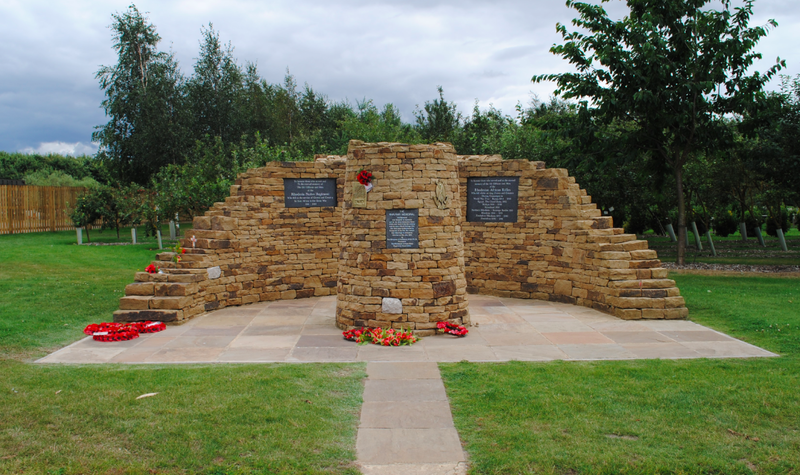 The memorial at the Arboretum is an exact replica of the one in Fallingbostel and was built by members of 2 Battn REME and Royal Engineers. 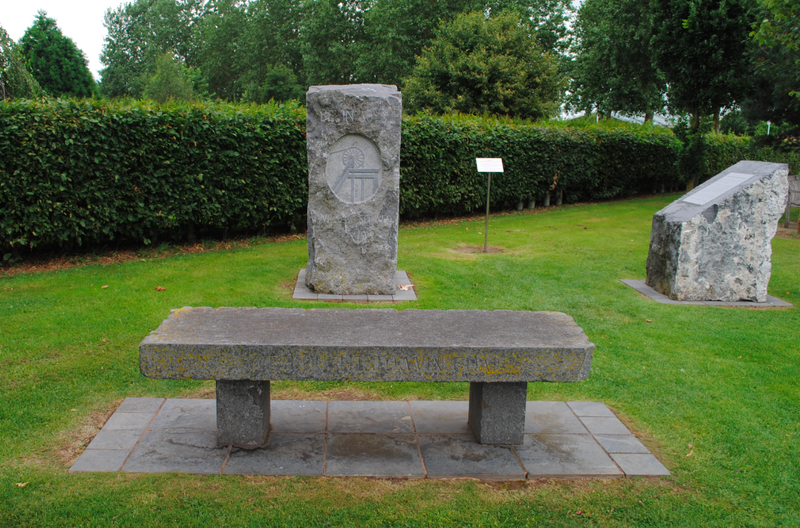 The memorial is dedicated to the memory of those made prisoner in World War II theatres in Scandinavia, Europe, the Middle East and North Africa. 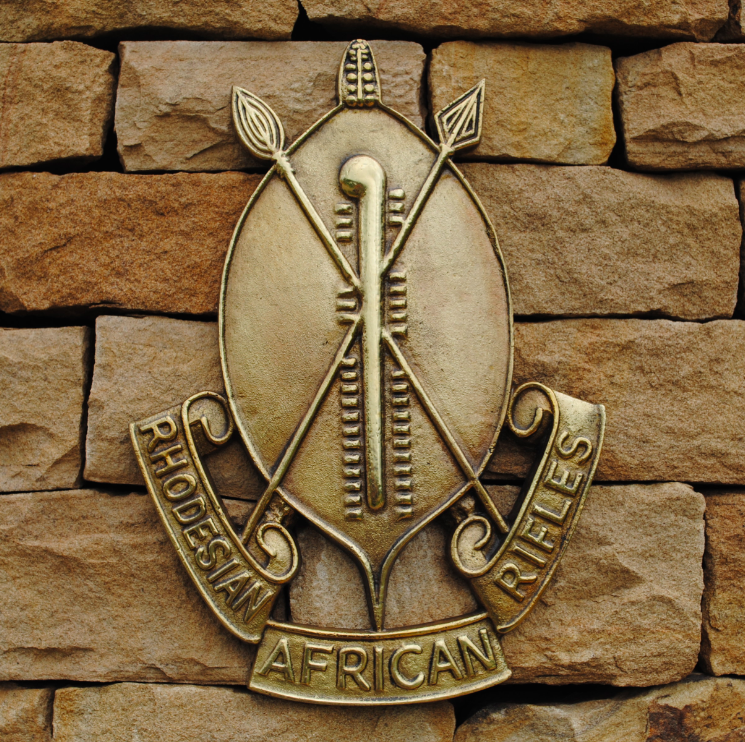 The above memorial at the National Arboretum is dedicated to the Rhodesia Native Regiment and the Rhodesia African Rifles Regiment. This beautiful monument honours those who served in the Rhodesia Native Regiment – some 195 men fell in East Africa in the Great War (1916-1919). A total of 311 officers and men serving with the Rhodesian African Rifles fell during campaigns in World War Two, Burma 1944 – 1946, Egypt 1952, Malaya, Nyasaland 1959, Northern Rhodesia/Katanga Border 1961, Rhodesia 1966-1979, Zimbabwe Rhodesia 1979 – 1980 and Zimbabwe 1981. The memorial was designed to represent part of the Great Zimbabwe Ruins which were built in the 14th century and are now a World Heritage Site. The ruins were re-discovered by Europeans in the late 19th century near Masvingo in Zimbabwe. The memorial was unveiled on 19th July 2015 by The Marquess of Salisbury, President of the Rhodesian African Rifles Regimental Association. Located at the end of Millennium Avenue at the National Arboretum is the Ulster Ash Grove. Planted as a living tribute to the members of the Royal Ulster Constabulary GC, the Royal Ulster Constabulary Reserve, the Armed Forces and other organisations in the service of the crown, the monument is dedicated to all those who lost their lives during the troubles in Northern Ireland between 1969 and 2001. 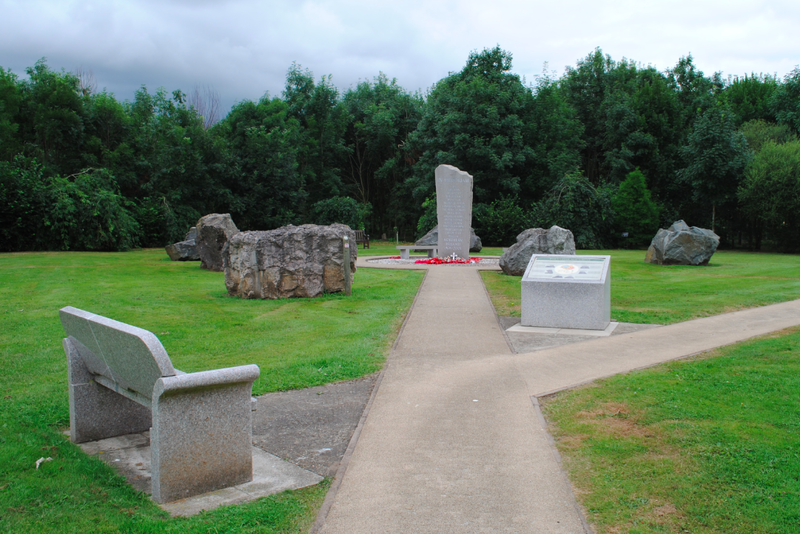 The weeping ash trees planted within the grove represent the lives lost in pursuit of peace and form a changing backdrop to the stone circle and Mourne granite pillar. The circle contains one block of stone quarried from each of the six counties (Down, Armagh, Fermanagh, Tyrone, Londonderry & Antrim) and are placed to form a symbolic map of Northern Ireland. 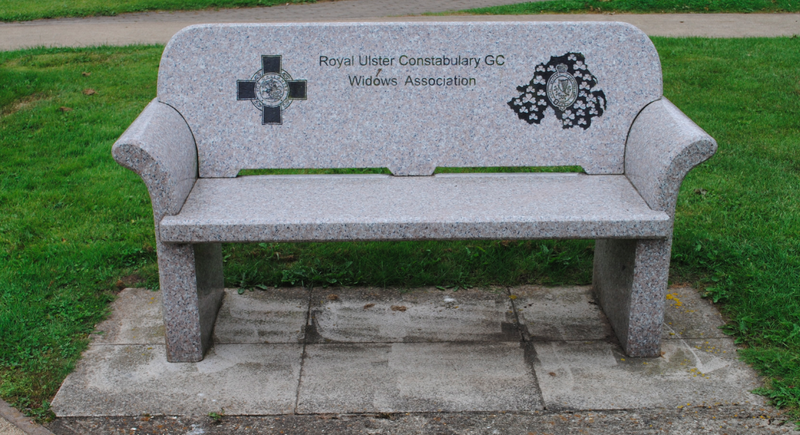 The Ulster Grove memorial was dedicated on 23rd September 2003 – the anniversary of the death of the first soldier in 1969. Located along Millennium Avenue at the National Arboretum stands the Bevin Boys Memorial. With only three weeks stock available, the country faced a crisis in coal production in 1943 which put our country’s ability to win the Second World War in jeopardy. The Prime Minister Winston Churchill charged Ernest Bevin, his Minister of Labour and National Service, to increase coal production. As a result, it was decided that one in ten men conscripts drafted to serve in the armed forces would work underground in British coal mines. The Bevin Boys, as they came to be known, undertook unskilled manual jobs to release more experienced miners to move on to coal production at the coal face. The memorial is dedicated to the essential and dangerous role of the 48,000 Bevin Boys. 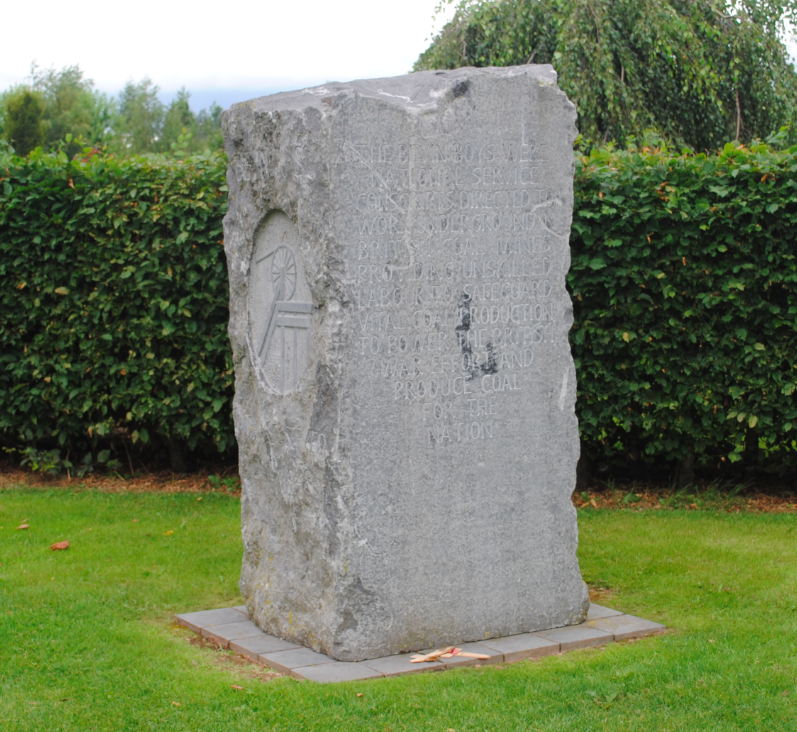 Created in stone from a quarry near Kilkenny, the rough surface of the memorial resembles the natural dark grey colour of coal, especially when wet. 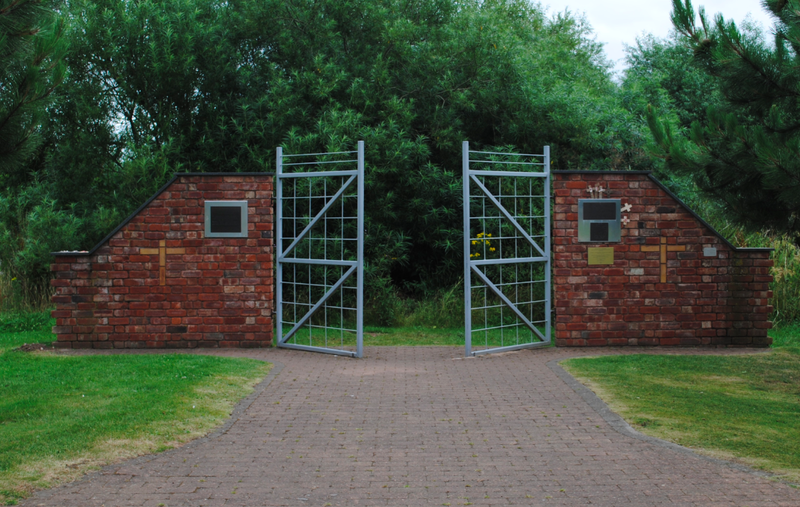 The Bevin Boys Memorial Project was funded by contributions from several councils and many individual private donors including the Bevin Boys Association and the Bevin Boys Association Reunion Group. 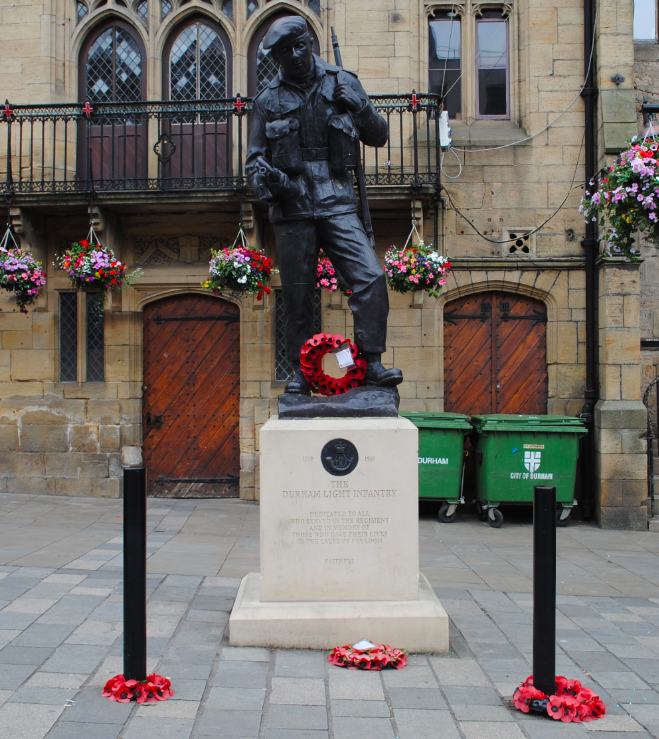 Located in Market Place in Durham centre stands the above war memorial. 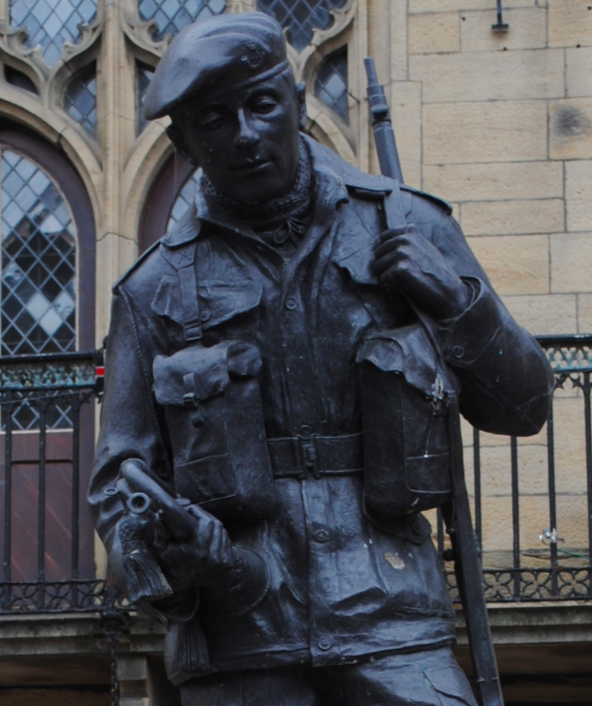 Honouring the Durham Light Infantry regiment, the bronze sculpture of a soldier symbolises the moment after the infantry buglers sounded the ceasefire in Korea in 1953. 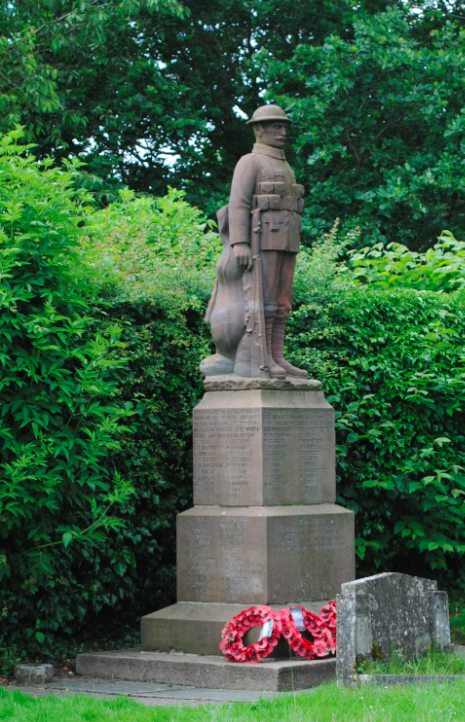 The sculpture is set upon a white stone plinth featuring the regimental badge and bears a dedication to all those who served in the regiment. 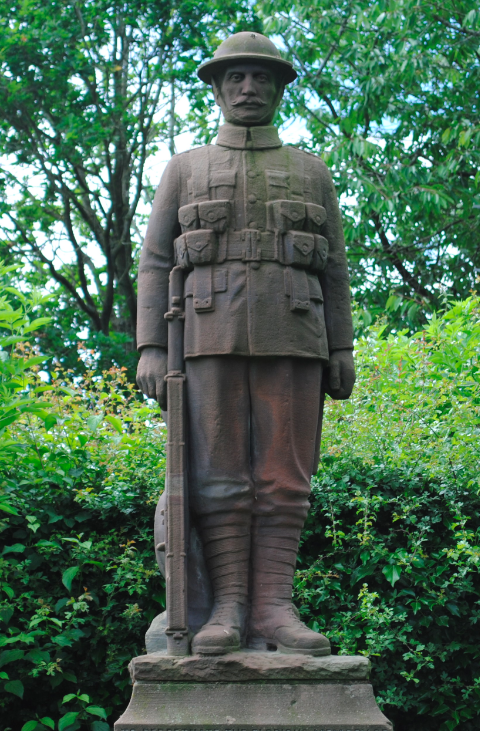 A quotation on the rear of the plinth from Montgomery of Alamein reads “There may be some regiments as good but I know of none better.” The monument was unveiled in September 2014 and is the work of Edinburgh artist Alan Herriot.